This morning dawned clear and calm and it beckoned me to take a nice cruise out to the heads to compare the speed prop and the standard prop. 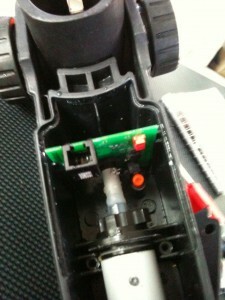 The standard prop is that safety orange colour that keeps popping up on Torqeedo motors and data sheets, and so on. I guess its their favourite colour. The speed prop is plain white so its easy to tell them apart. Its not so obvious in this picture but you can probably pick up that the standard prop is finer and especially towards the tips of the blades. 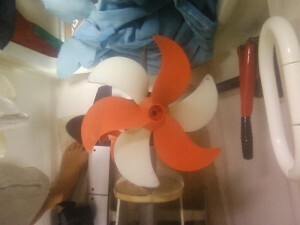 The white prop feels thicker as well – perhaps it needs to be because of the extra surface area. But I didn’t measure this – its just how it feels. Here’s another photo with the props more or less aligned on their leading edges. The shape of the leading edge is curved differently, so it can’t be an exact alignment but its close enough for you to get the picture. The pitch of the standard prop is ten inches, compared with the twelve inch pitch of the speed prop. This extra 20 % of pitch should mean an extra 20% in speed for a boat whose drag is nicely matched to the power of the motor. On this test today there is more than usual drag because the bottom is beginning to get some growth and she’s towing a dinghy. 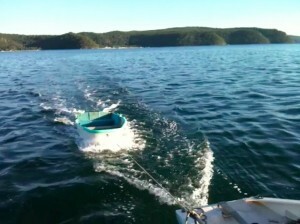 It was from this dinghy that the errant 801 took its swan dive. First part of the trial was out to Broken Bay heads on the white prop – and I had in mind to swap props when I got out there – but thought better of it and decided to return to the mooring and swap the prop in more controlled conditions. 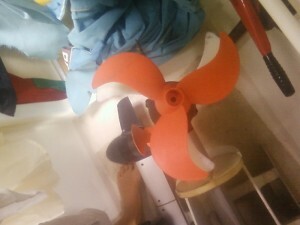 After fitting the standard prop I went out and repeated the readings again. The conditions were identical. What it shows is that the only difference is top speed. 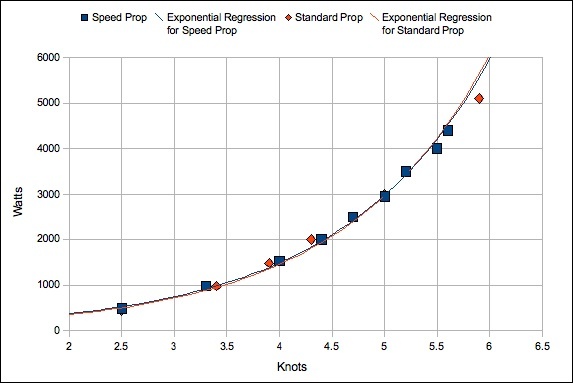 Otherwise the props perform identically comparing speed and power. If there was a way of measuring revs we’d probably find that there’s a difference in rpm at a given speed. I think the limiting factor is the power of the motor, and the speed prop overpowers the motor on this boat. Think of it as driving a car in too high a gear. The speed prop is like an overdrive gear – on a nice flat road under good conditions you can get a higher top speed in overdrive. But load the vehicle in any way, such as a hill or headwind, and its better to choose a lower gear to get the best speed. I’ve been favouring the speed prop because it is better in reverse, and it seems that there’s no penalty in efficiency at any particular speed in choosing the speed prop. When running at top speed with the standard prop it was absorbing 5100 watts and after about 5 minutes the controller automatically reduced this to 4600 watts when the motor began to get too hot. The thermometer symbol appeared on the throttle control and so I cut the power back down to about 2000 watts. After a minute or two the over-temperature signal disappeared. Careel boatyard has lent me a small dinghy to make it easier to come and go outside office hours. The Torqeedo 801 works well on it – its a hard bottom dinghy and scoots through the water nicely. Unlike my inflatable avon which doesn’t have a transom for stiffness and tends to bend a lot under the force of the motor. As well it has a soft bottom and just doesn’t allow any speed. I went ashore with plans to put some buffers on the dinghy – using some so-called noodles which are used as flotation in swimming pools. I needed some more stuff from the boat for this project and went back out just to pick them up. I was only on board for a few minutes and ready to return and noticed the dinghy is motorless! The was a little wind and a small chop coming across from the west – surely that could not have dislodged the 801? And only yesterday I checked the screw clamps for tension as I was coming in to the dock. How could they have come loose in that short time? But something surely has because there’s clearly no motor on the dinghy. When the water is still I can easily see the bottom and all the crayfish holes in the sand. But today the chop is enough to stir up the water enough not to be able to see the bottom. Somewhere down there is a Torqeedo 801. I launched the avon and tethered it behind Current Sunshine because its easy to get into from the water. Then with wetsuit, goggles and fins started to search. Snorkling on the top was not good enough – I still could not see the bottom clearly. The depth sounder usually shows around 4m at this mooring and the tide is low so perhaps the depth is even a little less than this. By diving just below the surface I can see the bottom clearly now but no sign of that bright orange and black motor. But I know it must be somewhere on the swing circle of the dinghy trailing out behind the tri. The wind is still variable and so she’s still swinging along the circumference and back again allowing me to trace the arc of possibility with duck dives. My ears don’t like this and complain about even this shallow depth – I’d starve as a pearl diver huh? The printed circuit could do with a good still drink - 95% ethanol. But there’s the motor on the edge of my vision – its seems so clear now I’m close. There’s a wispy stream of fine bubbles rising up from the battery. Salt water is a good conductor and who knows what interesting chemistry is being cooked up down here as the battery dumps its electrons. I grab the motor and wonder how heavy it will feel when I reach the surface – buts its light enough and I push it over the gun’l of the hard dinghy. Then flop into the avon. It didn’t take long – maybe I was five minutes at most in the water. That means the motor could have been submerged for perhaps 15 to 20 minutes. 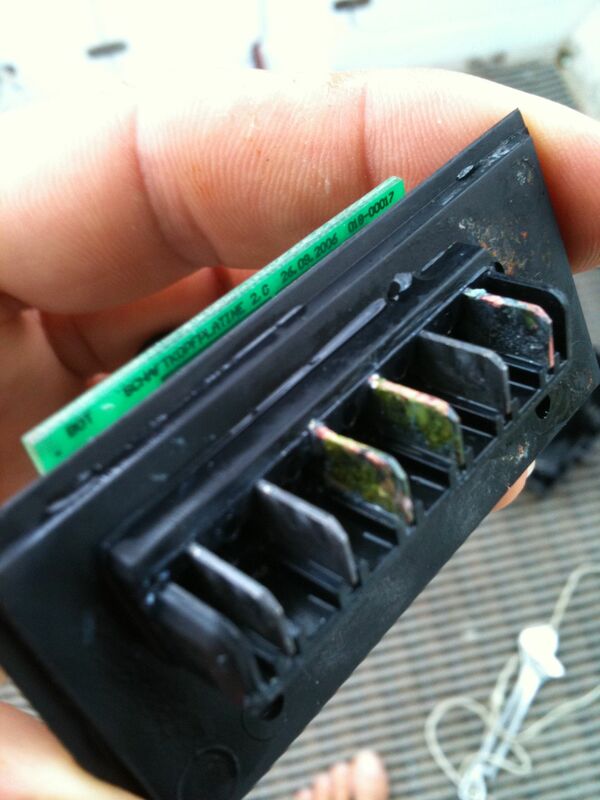 This circuit board is from the top of the motor - the red terminal could be sus. On board now and the water that pours out of the battery is green. I wonder is that chlorine? 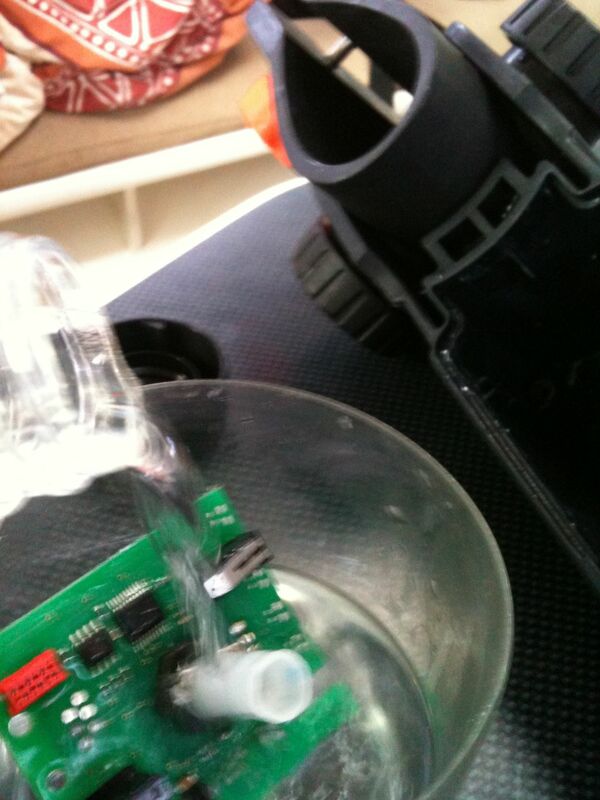 After all salt is just sodium chloride and perhaps the stream of bubbles coming out of the battery was chlorine gas? 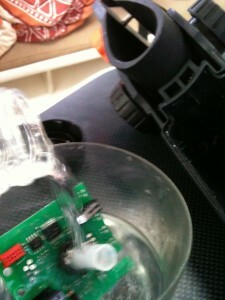 I pour fresh water over the motor controller and the battery. The fresh water comes out green also. I suspect the battery is cooked. I have a little metho (methylated spirits or alcohol) available and tip that into the tiller arm (which has the throttle control) and into the top of the motor where I know there is a circuit board. But I have no torx screwdriver long enough to get at the screw. Cooked as, bro - cooked as. To shore and then to the hardware shop and back takes a long hour, and I can begin pulling things apart and washing them in alcohol. 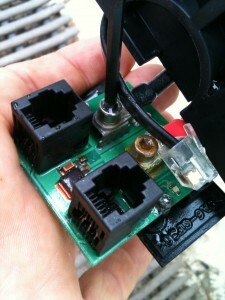 The circuit boards from the top of motor and the tiller arm look in good condition. Even so the red terminal shows some oxidation on front and back. Perhaps there was a current was flowing through this terminal. 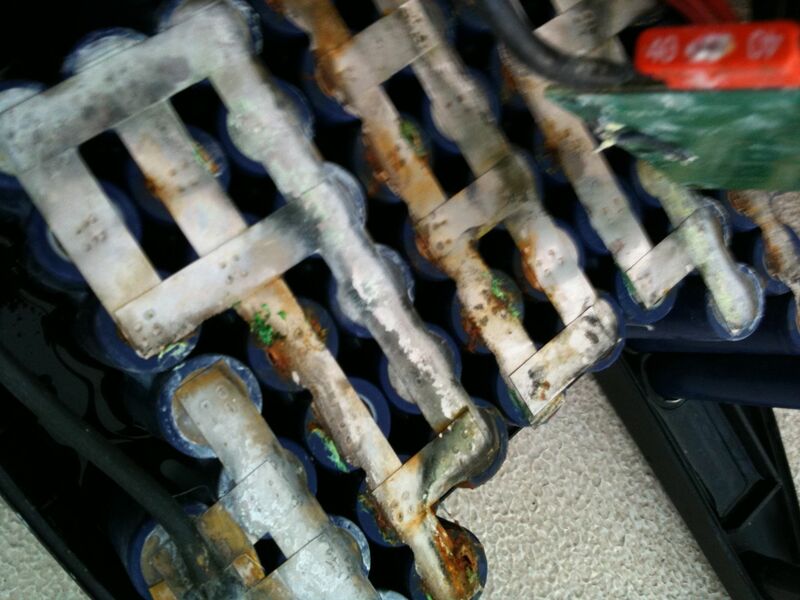 After seeing the green water flow out of the battery I suspected the worst and so left it to last – thinking it was probably beyond resuscitation. So the other circuit boards got my first attention. Perhaps they’ll still be working. But after opening the battery… well take a look yourself. Its not pretty. Its still a mystery how it could have flipped off the dinghy. I checked the bracket and it was only just snug and could be lifted off the transom. It doesn’t make sense that the screws could have come undone. But then again, the transom is made of a couple of layers and was flexing under the load of the motor. Could its delamination have allowed it to loosen and shrink a little? But the mystery remains. And now what to do about getting it fixed? Luckily I have insurance. Well, no, I didn’t buy the company (I wish!) but I have made a decision to be a Torqeedo dealer. Those following this blog will know that I enjoy helping other boaters configure their electric boats and so its a natural progression to be able to help by selling them too. I met with Claude, the Australian distributor when I was back in Queensland last week and we worked up a plan as to how I can help out. I’m in a good position to be able to demonstrate them because I have two of them – a Cruise 4 for the main engine and a Travel 801 on my dinghy. In a practical sense I’m not sure yet how this will unfold, but my main interest is still to help boaters setup up their boats to be electrically powered, whether thats Torqeedo powered or otherwise, and I’m wanting to continue to do that as best I can. I enjoy helping to find the best solution, and so whatever kind of electric boating you are interested in, still drop me a line (just use the comment facility), or phone me on 0409 466 271 and I’ll help out however I can. To begin with I’ll add some more pages to this site with practical information about Torqeedos, such as technical specs and prices, and how to contact me for a demo. And we’ll see where it goes from there. Whatever your interest in Torqeedo, or electric boating, don’t hesitate to get in touch with me.